After a period of relative under-performance from '99 to '04, In 2005 Hindustan Unilever undertook a massive 'culture-reboot' that focussed the length and breadth of the organization on making a 'real-difference' to every Indian. In putting the needs of the country ahead of deivering the next quarter sales forecast, a more inclusive growth story has emerged. At the start of 2004, Hindustan Unilever (HUL) was at the crossroads. In the period from 1999 to 2003, growth in the organization had slowed considerably, new innovations hadn't caught the imagination of consumers and the equity of a number of iconic brands had begun to erode. In a number of categories that HUL had dominated for many years, market shares were now beginning to erode. HUL for a long time had been the darling of the stock exchange and for the first time in many decades, was underperforming the exchange for a while now. With every passing quarter, an obsession with the immediate day's sales had crept into the entire organization. The delivery of a week's sales target had become the over-riding priority right from the frontline salesman to the directors of the organization. In this relentless pursuit of sales growth, and fixation with the short term, the organization had lost contact with its consumers, customers and stake-holders. Annual General Meetings, which for many years were hosted at Birla Matushri Sabhagar, 19 Marine Lines, Mumbai, morphed from being a celebration of the management of the company into a vehement criticism of the organization and its short term policies. Shareholders who in earlier years had recited poems in praise of the company were now the foremost critics of its short sighted pursuit of profits. While there was an acknowledgement among both management and employees that something was amiss, for a while it seemed like it might be too large a problem to get one's hands around. A diagnostic of the organization in August '04 threw up behaviors consistent with extreme capitalism. There was a high achievement orientation - managers were ambitious and driven. People were driven by individual needs and only asked, 'What's in it for me?'. Result and performance orientation had been carried to an extreme where ends justified the means, even if they weren't consistent with the values of the organization. A glorious history of growth through the 90's had left large parts of the organization very arrogant, and hence closed to learning and change. When Eric Vogt, Janet Jones and Dennis Encranation presented these findings without making any effort to sugar-coat this bitter pill, it was clear that a quick-fix wouldn't do. The situation called for open-heart surgery. 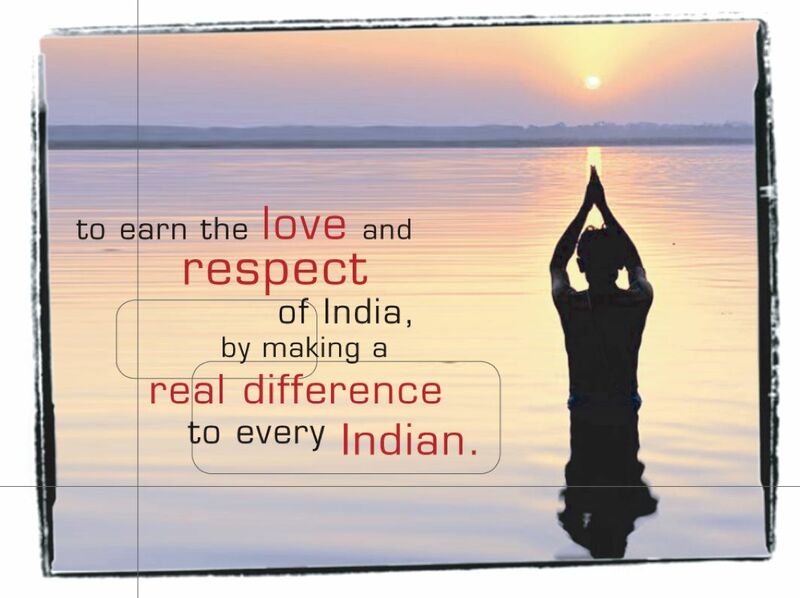 From this work came the vision of the organization that brings goose pimples to people in HUL even today. To support this vision, it was imperative that the organization articulated a set of beliefs that support this vision. The beauty of these beliefs lay in their simplicity. From a culture of incremental innovation to meet short term needs, a comprehensive REAL DIFFERENCE test was created to make sure that projects met this criteria. "Making a real difference" meant that all our actions must make a real difference to every life that we touch - Consumers, Customers, Community Partners, Shareholders. Genuine. Real. Tangible. Emotional. Implict was the recognition of the responsibility that arose from HUL’s unique position and brands make a real difference to the consumers by adding vitality to their lives. A detailed timeline of the interventions from August '04 to Dec '05 is below. There were three significant challenges involved in the implementation of this organizational transformation. 1. 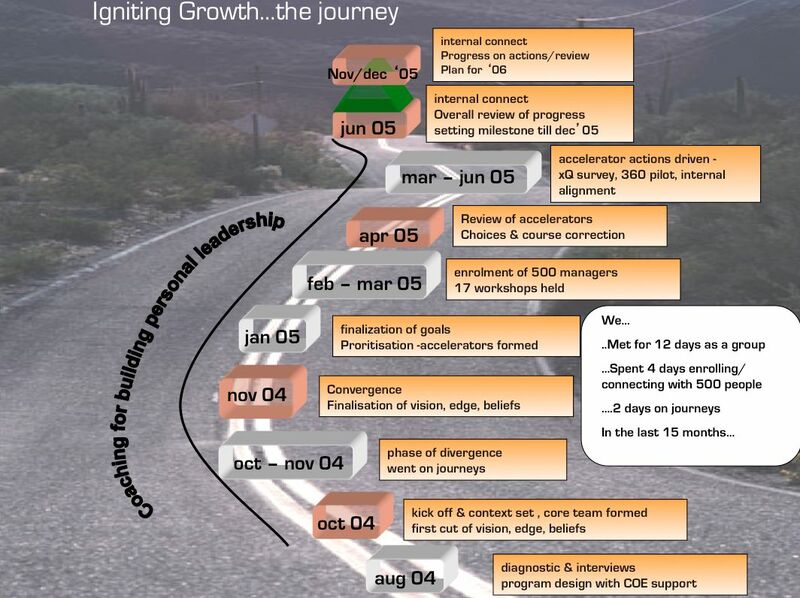 Getting Great Execution - Execution was highlighted as a key challenge and the entire organization was put through the Franklin Covey approach to execution. Over 150 teams were covered by the xQ survey and the 4 Disciplines of Execution approach was implemented across the business. Synergy and Accountability emerged as the greatest need areas for the organization in the benchmark survey. In the follow up survey done in March '06 the baseline execution score had moved from 61 to 89 which put the organization in the Top 10% of organizations worldwide. 2. Living the Beliefs - The real difference filter was applied at first to all marketing projects; with a plan plan to apply the filter to the other functions also at a later stage. A customized 360 on some key behaviors (team commitment, Intellectual honesty and respect for others) around beliefs was rolled out to all people in leadership roles irrespective of seniority in the organization. There was coaching support to help in development wherever an individual needed assistance. Finally, all HR processes were aligned to ensure that people across the organization live the beliefs. 3. Opening up Minds - This was probably the biggest challenge because it required that people that prided themselves on the glorious past, admit to inadequacies. In the journeys to open their eyes to best practice in other organizations there was an acknowledgement of where we are and why that wasn't enough. That opened up a space for co creating the future and enrolling our people while also addressing our personal capability. All along it was imperative that senior managers were listening to / acknowledging any progress that the organization was making. In all of this, the key however was the emergence of a new language, where people we talking win-win and putting the country and company ahead of their petty agendas that had held them back in the past. -Internal connect feedback shows 83% positive with IG. This cultural shift was backed by changes across a number of processes in the organization to almost hard-code some of these into the new DNA. 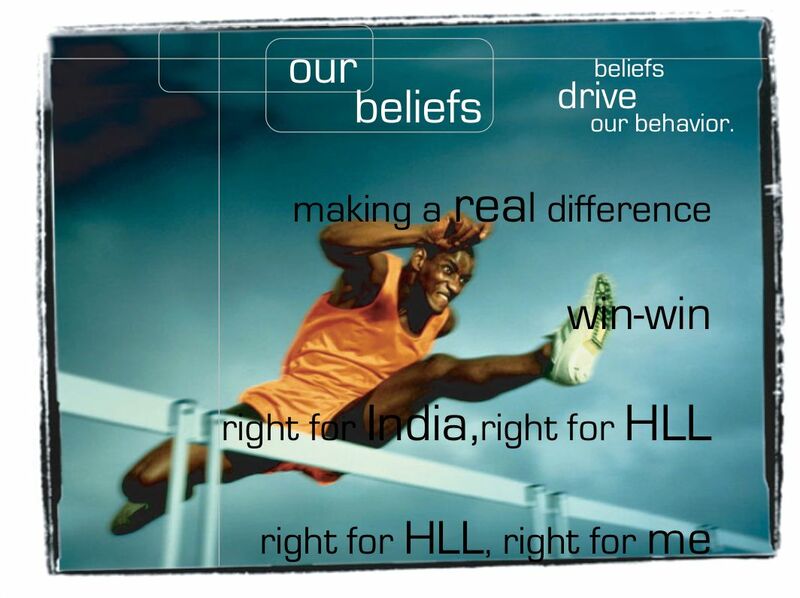 The shift in values/mindsets has had a real and lasting impact on how has HUL managed itself after the program. In celebrating it's 75th year in the country in 2008 (the company was incorporated in India on October 17th, 1933) managers across the company worked a total of 75000 (1000 hours for every year that the company had been in India) hours giving back to the country. While some volunteered at schools for the underpriviledged, others helped NGOs. Every manager did their bit in getting to the 75000 hours by the 17th of October 2008. - If we are opening up a new factory, Is this a win--win situation for the company and the local economy in which we are building it? - If a new project came up for approval, Does this project make a 'real difference' to the lives of Indian consumers? - If there was a major decision about a large brand, Is taking a price increase right for India? The cultural shift was integrated into the performance appraisal system too. Each manager was required to detail how he / she had lived the beliefs. Everyone had a 'Real-Difference' objective on their targets for the year and these were given higher weightage in the evaluation process. This shift continues even today and the organization strives to set the standard in the areas of sustainability and recycling and minimizing its carbon footprint. Before we get to the learnings it might help to look at the steps involved again. While there are many things to be learned from this fascinating story of organization transformation there is only one that I want to emphasize. About a couple of years ago, I was at the launch of a Future of Work Seminar, an event for young professionals where a few leaders in the community were giving advice on shaping organizations for the future. The man who spoke before the main speaker was an eminent businessman in India. And he said to the young people, “I’m going to give you the same advice that my father gave to me and that is that you can’t do good until you do well.” He encouraged the audience to get to place of standing in society and then focus on making a real difference. I however felt exactly the opposite. He felt you had to do well, you had to become rich, before you could start to give back. I suddenly realized that separating doing good from making a profit is what has caused all the problems in the world —the environmental devastation, the social devastation—it’s been caused by separating profit from goodness. There’s no reason why we can’t combine those two things. And if we do combine those two things, if we make our money in a way that benefits mankind, then we can solve the same problems that we created by separating the two. This is a really important idea and HUL stumbled upon it when it really needed to. This notion of "Doing Well By Doing Good" has been popularized by a HUL alumnus who now is the COO of Unilever, Mr. Harish Manwani. In unveiling an ambitious Sustainable Plan a year ago, HUL put India at the center of its agenda. More recently, reporting after a year of the plan, HUL Chairman and Unilever COO, Harish Manwani said:"In Unilever, we believe that our future success depends upon being able to decouple our growth from our environmental footprint, while at the same time increasing our positive social impact. Many of our goals look as daunting now as they did when we announced them, but you have to set uncomfortable targets if you are to really change things. Sustainable growth will be the only acceptable model of growth in the future, which is why we have put the Unilever Sustainable Living Plan at the heart of our business strategy. And far from being a hindrance to our progress, we are now seeing increasing evidence that it can drive business growth." Combining Profit and Goodness creates a heady cocktail of possibility and hope, just the one we need to douse the rampant fires that unabashed capitalism has sparked across the global economy. Very interesting and insightful story about the transformation of HUL in recent past. I am interested to understand more about the recognition of need and initiation of change than the journey. In most of the situtations, especially, dealing with large corporations the beginning itself is the most difficult hurdle to cross. How did that happen with HUL? Was it recognized and initiated by the management itself or an action taken by management hearing the voices of shareholders and stakeholders? I hope I haven't missed this point in the story presented.